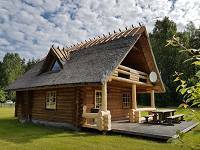 If you are looking for a pleasant, peaceful summer residence in Saaremaa, then Järis, located in Western-Saaremaa, is a perfect choice for you. You can find our summer cottage on the eastern side of the beautiful Lake Järis, 300 meters walk away. The swimming place is sandy and smooth, very suitable for children. There are also good fishing opportunities for you to enjoy. Forests are suitable for mushroom and berry picking. Seaside is near, just a small drive away. The capital of the island is Kuressaare, is less than half an hours drive away. Our cottage is located on a big plot with a large garden and lots of space for children to play, run and have fun. There are also facilities for BBQ and Sauna. 5 + 2 Beds: 2 double-beds, a single bed and thick air mattress for 2 people. Parking next to the house. Pets are allowed.